Download Microsoft Outlook from the Google Play Store. Tap on Outlook to run it. Enter your Xavier email address, and tap Continue. 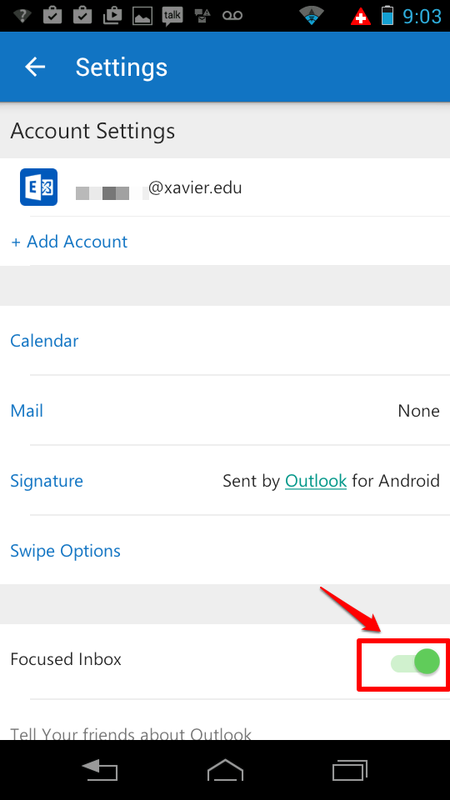 When prompted to choose an account type, tap on Office 365. You will be redirected to a Xavier login page. Enter your Xavier credentials in the spaces provided. Click Sign In. By default, the Outlook app detects which emails are "more important" to you and splits the Inbox into two areas- one for Focused email and one for everything else deemed "less important". You can turn this feature off by accessing Settings and deselecting Focused Inbox.